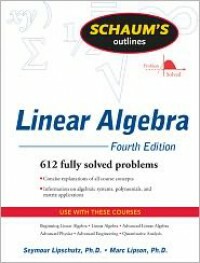 Goes well beyond an "outline" of elementary linear algebra, especially when compared to the course textbook I was assigned ([b:Elementary Linear Algebra with Applications|678724|Elementary Linear Algebra with Applications|Howard Anton|http://d.gr-assets.com/books/1177073363s/678724.jpg|1776254]). Schaum's Outline provided all the same relevant theorems and proofs in rigorous mathematical language while taking time to define common mathematical notation for non-initiates. There are plenty of exercises at various stages of difficulty and application with thorough explanations for most solutions and step-by-step guides for some of the initial problems. There were very few typos or errors that I noticed and the narrative progression of concepts is well-chosen and explained. This "outline" is pretty much all you need to get through an elementary linear algebra course.